My AP class literally laughed out loud when I put that up on the board and I hope they have the same reaction and maybe help them realize that I have the same reaction when I see them manipulate some of the algebraic expressions the way that they do. Any ideas on how I can do an Algebra boot camp of sorts to remediate some of these misconceptions? Are these normal Algebra mistakes for a senior in high school? Do other people have similar problems? Posted on November 12, 2011, in Calculus, Teaching. Bookmark the permalink. 17 Comments. The title of this post was something I said in my calculus classes often as well. Yes. This was common in my math classes. Understanding what comes as a single package and what is the lone-wolf maverick is what they often have trouble with (and I think that’s part of what you’re seeing in both cases above). Mostly, there’s just sooo much stuff to do in calculus, that they don’t take the time to think about what’s going on. I bet they do know the order of operations and could piece it together in the correct way if they went slow enough. Taking calculus, I bet most of these students are the “smart kids” and they tend to have that problem of rushing through things. It has also been my experience that students struggle with algebra and trig in calculus. But I remember this from my days as a student. While I always did well in my math classes, I didn’t really understand the content and make connections between it and other courses until the course was over and I was in the “next” one. Algebra boot camps are good ways to handle issues (but they have worked best for me when I do them as needed in the course and not at the beginning of the year). My question is what can we do as teachers in the classes we teach to help kids make those connections and deeper understandings? I don’t want them to have to wait until calc 2 to understand calc 1.
yeah totally! I want to explain to them why a lot of the algebra things they are doing are crazy but it feels “off topic” because i’m supposed to be talking about calculus… i want to find ways to have them have deep, intuitive understandings of the algebra instead of “you can’t cross out the factors when there is a plus in between them”. Could you combine the algebra problems with calculus somehow? Like “Consider (x+1)/x. If you cancel the x’s you get 1. The derivative of 1 should be 0, but if you use quotient rule (without cancelling) you get something besides 0!” You’re firing your canon at a fly there, but if they get the calculus, that might make more sense. great point. i tend to write “ALGEBRAAAAGHGHGHGHGH” or something like that really big when I should be congratulating them on getting the Calculus right. My students make all the same mistakes. 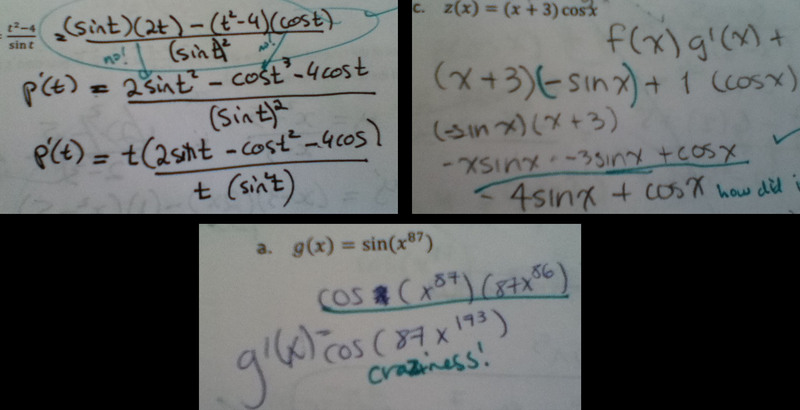 Less trouble with the trig, but definitely the parentheses messes them up. I did have student recent solve ln(x)=1 as x = 1/ln…. I almost cried. They have trouble thinking of sin, cos, ln, etc. as functions and not as variables. I have not really done anything specifically aimed at correcting this other than correcting the work on individual student papers and hope they learn from that mistake and do it correctly thereafter. I have had a little success (with only a few students, but better than none) by relating those functions (ln, sin, cos, etc.) to “squared.” By the time they get to calculus, we’ve usually trained them out of trying to “distribute the squared,” so they know that (x+2)^2 is not x^2 + 4. So, I usually tell them to think of ln or sin or whatever as “squared” and you can’t just distribute it or divide by it or treat it like a variable/constant. Again, out of the dozens that have the original problem, this may only help 2 or 3, but some is more than none! yeah, totally! that helped me too with the kids who treated something like cos(x^3+x) as a product of cos and (x^3+x). some kids were just writing “cos” down, and I showed them that it was like writing squared with nothing inside…. ( )^2… which I think really helped a lot. great point with talking about the distributing, I will try that (though that’s a point that has still not sunk in for a bunch of students). I like the “not respecting the trig functions as operations” title … I had never thought of it as disrespect, but it really is. And I don’t think there’s any shame in teaching prerequisite skills. A student once told me that she will always remember how to add and subtract negative numbers because of me. It’s not going to change the world, but hey. went through this as an AP teacher. there is no remedy to this problem unless the student has already paid attention to his arithmetic/trig/algebra foundation and makes a serious conscientious effort in strengthening it continually even throughout the summer breaks. otherwise, it’s a waste of time. that’s the nice part about math: everything is cumulative. I had straight A’s in Algebra and Algebra 2 but couldn’t get my mind around pre-calc to even advance to actual calculus. It’s one of my biggest regrets in life. Have you ever had students like that and figured out how to get them past that mental block? I have had so many students with huge math blocks in their head that have turned it around and succeeded (and others who haven’t). One of the things that I think has helped most is getting my class to embrace a growth mindset, as coined by Carol Dweck. Not a cure all, but definitely a start!! Just reading these posts, I totally have the same frustrations. I have classes from Grades 9 through 12, and I have started to vocalise the following early on in all my classes, that yes – Math is one of those subject where parantheses (or brackets) whichever one you call them, occasionally have different meanings in different contexts. For example, f(x) is f OF x where x is a variable, as with sin, cos, etc – they are FUNCTIONS, not MULTIPLICATION (so ‘f’ is not a variable). I literally force them to read it f OF x, because perhaps it’s because we say “sin x” the same as we say “ax”, that causes confusion when, in fact, they mean entirely different things. Also, I encouraged my students last year, at least in precalculus, to always write the paranthesis and maintain them for things that are functions (like trig functions) to keep that in the forefront of their minds. Hopefully that sticks going into calculus – we’ll see. On that note, I read another similar conceptual understanding issue with inverse notation and an exponent of -1, as in x^-1 having identical notation to f inverse of x – but comes up less frequently. Perhaps the language of Math isn’t as clear-cut and intuitive as it seems to us Math teachers. I keep hearing parents today tell me that kids are taught math differently now than when we were in school. They’re taught a method that doesn’t involve solving the problem on paper so much as in their heads. Is there a name for this “new” process that today’s kids are adopting, and if so, how do I sign up?